What can a painting tell students about the history of trade between nations? Artist Fitz Henry Lane lived at a time when many Americans, especially those living in a port city, were off exploring the world, delivering and receiving goods, having adventures, and living in a global community. They couldn’t do this without their ships. These vessels served many purposes. 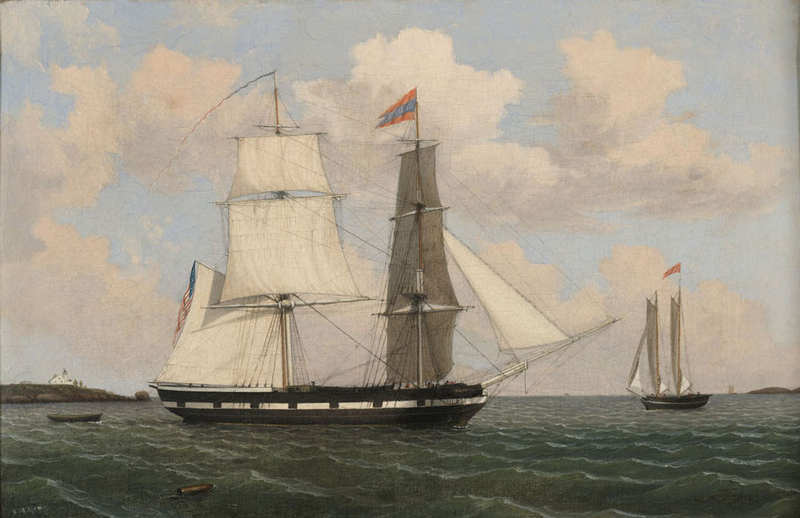 This lesson will utilize primary sources such as images, logs and letters to learn more about three nineteenth-century vessels. Students will discuss and answer the question: What role did Gloucester vessels play in the nineteenth century global economy? Students will locate and label countries and bodies of water on a map of the world. Students will research the history of two nineteenth-century vessels. Students will identify and locate ports of origin and destinations on a world map. Students will research and record the cargo and purpose for each vessels’ excursion. Explain to the class that they will be using Fitz Henry Lane Online to help them answer the essential questions: What role did Gloucester vessels play in the nineteenth century global economy? Where were they going? What was their cargo? Hand out blank world maps to students. Have them label the following: Atlantic Ocean, Pacific Ocean, North America, South America, Europe. As you zoom in and around the painting, start to think about what this image might tell about maritime commerce in the nineteenth century. Read the commentary to learn more about the Brig “Cadet”. Scroll down to learn more using the historical materials. Begin filling in Worksheet 5. Once all of the information has been written, have the students locate the “Cadet”'s port of departure and port of destination on the world map. Follow the same procedure with the painting Burning of the Packet Ship "Boston", 1830 (inv. 82) and fill in Worksheet 5 together. The information needed to complete the chart can be found in the commentary below each painting or within the related historical materials. Place students in pairs or small groups and ask them to locate and label on their world maps the port of departure and port of destination for the ship “Boston”, using Worksheet 5 as a reference. Create a key, assign each ship a color and plot each vessels’ journey. Using their maps and their charts students should be able to identify nations that were trade partners and examples of products that were traded between them. Students can research the history of the “Jamestown” Departure of the "Jamestown" for Cork, Ireland, 1847 (inv. 475), add it to Worksheet 5, and plot its port of departure and port of destination on the world map. Once this is completed students should answer the following questions: What made the “Jamestown” different from the "Cadet" and "Boston"? What role did the “Jamestown” play in global affairs? Cite evidence to support your answer. 11. Give examples of products that are traded among nations, and examples of barriers to trade in these or other products. E.1 On a map of the world, locate the continent of Europe. E.2 Use a map key to locate countries and major cities in Europe: United Kingdom. SAM.1 On a map of the world, locate South America and the Atlantic and Pacific Oceans. SAM.2 Use a map key to locate the countries and major cities of South America: Suriname. Citation: "Setting Sail for Distant Horizons: Cape Ann Captains and their Cargoes." Fitz Henry Lane Online. Cape Ann Museum. http://fitzhenrylaneonline.org/resources/for_teachers.php?name=Lesson%20plan%203B:%20Grades%206-8 (accessed April 22, 2019).